In support of Breast Cancer Awareness Month, Macy’s has donated $100,000 to the Breast Cancer Research Foundation, regardless of sales. While that sum may be out of reach for most of us to consider donating, each of us can do our part by supporting The Pink Shop at Macy’s. 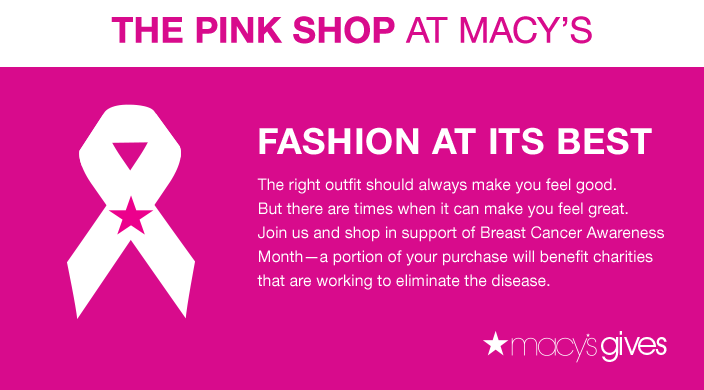 Macy’s Pink Shop truly represents fashion at its best! While the right outfit should always make you feel good, there are times when it can actually make you feel great from the inside out. 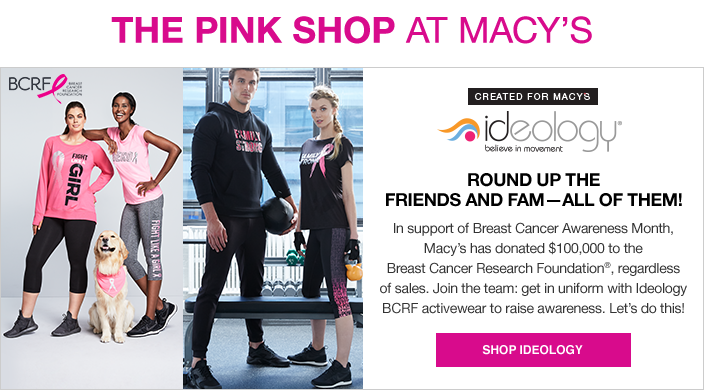 When you join Macy’s and shop in support of Breast Caner Awareness Month at The Pink Shop, a portion of your purchase will benefit charities working to eliminate the disease. Macy’s Pink Shop features fashion and accessories of all sorts this year, including fitness selections created exclusively for Macy’s by ideology. When you get your friends and family to ‘join the team’ and get in uniform with Ideology BCRF activewear to raise awareness, everyone wins! 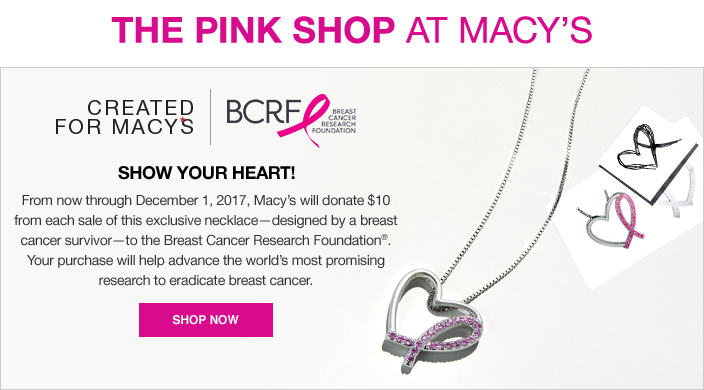 From now through December 1, 2017, Macy’s will donate $10 from each sale of their exclusive necklace – beautifully designed by an actual breast cancer survivor – to the Breast Cancer Research foundation. Not only will your purchase look beautiful on whoever wears it, serving as a constant reminder of hope for a cure, but it will also help advance the world’s most promising research to eradicate breast cancer. Now that’s shopping I can get behind! Don’t you love when your shopping dollars serve a bigger purpose? After all, that’s the true definition of shopping smarter: finding something you truly love while your dollars do double duty. And don’t think The Pink Shop is just clothes, far from it; you’ll actually find everything from specialty perfume to pillows at Macy’s Pink Shop! So even though donations will keep going beyond this month, don’t wait to shop for a cause at The Pink Shop because, after all, the sooner we start supporting the cause, the sooner we discover a cure!